Friend: "Fill in the blank: the Christmas season has not started until..."
Me: "Until I have had my Christmas nervous breakdown." My 12 year old son: "Well, I guess it must be Christmas!" I have been on overload like everyone else. Today with the inspiration of my favorite duo, Chrissie and Mandi, I found my happy place again. This week is Theme Week and Chrissie and Mandi have chosen MUSIC. Paper: Real Red, textured linen, pearl finish. Ink: VersaMark, Ranger Antique Linen distress ink. VersaFine Onyx Black. Stamps: PTI Christmas Blessings, Waltzingmouse Musical Backgrounds. Supplies: Memory Box Flowering Christmas Tree die, gold embossing powder, self adhesive crystals, Scor-Tape, corner rounder. In case this is my last post before Christmas, which is probably a sure bet, Christmas Blessings to you, however you spend this special time. Wishing you peace and some time to enjoy the beauty that is at the heart of the season. Merry Christmas. This card is so beautiful! Love that white tree. What a beauty! I'm glad that you've find back your "happy place"! Stephanie, I am so glad you got some "me" time to make this card. It is truly striking and beautiful. If it looks this gorgeous online, I can only imagine how pretty it is in person. Glad to see I'm not the only one who has Christmas panic breakdowns and admits it!!! Okay for you Stephanie, I am really envious. 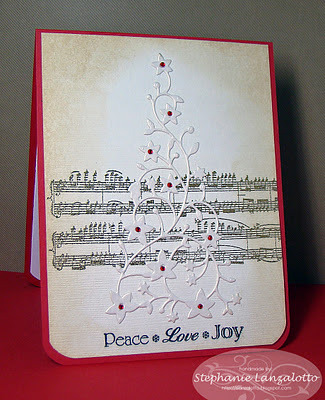 I am seeing your lovely cards and you used Memory Box dies too! I have been looking, but don't want to pay what they are asking. This card is just so gorgeous!!!!! Loved your quote Steph... it really made me smile... and your card is simply gorgeous. Thanks so much for your fabulous support...we're so glad we're your favourite duo! Wowers girlie...this is gor to the geous!!!! Lovely card, Stephanie. Glad you found some crafting time. Hope you and your family have a wonderful holiday. Ann Y.
I think that quote relates to all of us over Xmas! Still have to put up the tree and wrap the presents, clean lounge and dining room - yikes! thank you for the kind comments, we are chuffed we are your fav duo! 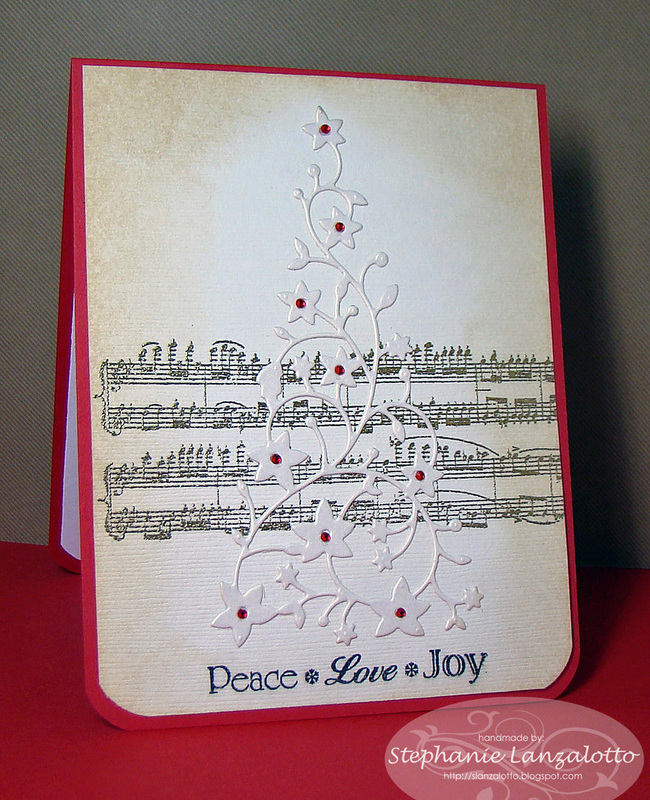 Simply beautiful card and yes, I guess it must make it almost Christmas!